ATK completed an in-depth review of the Liberty launch system, which consists of a rocket and a seven-passenger space capsule. The review was the last of five milestones required under the unfunded Space Act Agreement (SAA) ATK inked with NASA during the second phase of the agency's Commercial Crew Development Program (CCDev-2). During the review, ATK laid out the progress it's made to date, discussing Liberty's schedule, system requirements, software status, flight test plan and safety procedures, among other things, officials said. NASA's CCDev program is designed to spur the capabilities of American private spaceflight companies, to fill the crew-carrying shoes of the agency's space shuttle program, which retired last July. "Liberty's expanded service allows us to bring a commercial capability delivering up to seven crew members, 5,000 pounds of pressurized cargo, along with external cargo in a single flight," Rominger said. "This results in tremendous value since all other commercial offerings would need two flights to accomplish what Liberty does in one." Orbital Sciences will use its Cygnus spacecraft and Antares rocket to make the flights. Orbital officials have said they're aiming for a test mission to the station this November or December, with the contracted flights to begin shortly thereafter if everything goes well. 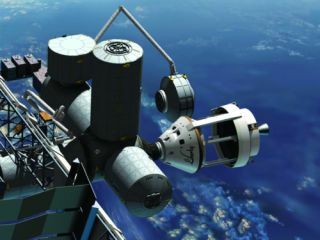 SpaceX has already flown a demonstration mission, successfully docking its robotic Dragon space capsule to the station in May. Dragon and SpaceX's Falcon 9 rocket may begin making the company's contracted supply flights as early as September, NASA officials have said.